Instagram/ofleatherandlaceTina Lee is behind the ‘Of Leather and Lace’ blog. While some of us may have settled for a takeaway, a glass of wine, and a cosy night in on Valentine’s Day, for others, the celebration of love was a lot more elaborate. If their posts on the photo sharing platform are anything to go by, the so-called “Rich Kids of Instagram” around the world – as well as various fashion and travel bloggers – appear to have enjoyed a bit of pampering yesterday. 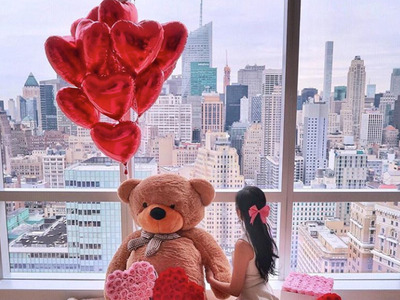 From gifts of brand new Bentleys wrapped up in ribbon to giant teddy bears and balloon-filled rooms, take a look at how the super-rich and bloggers of Instagram marked February 14. Instagram user and blogger Tara Milk Tea from Sydney shared the stunning bathtub view from the Pier One Sydney Harbour Hotel with her nearly 1 million followers. …As well as a giant teddy bear surrounded by several heart-shaped gift boxes. …While another appears to have received a Mercedes-Benz. There were plenty more giant soft toys, and some were tucked into the back of flashy cars. New York-based car enthusiast “Alex,” also known as “Supercar Blondie,” was apparently surprised with a red Ferrari filled with roses. Watch the moment it was delivered here. …As did fellow blogger @eljackson, who proposed to his wife @hilvees four years ago to the day, according to this post.